On March 4th, 2017 four people were arrested at a counter-demonstration in response to a Trump rally in Olympia, Washington. The arrested were there to oppose the Trump administration’s attacks on immigrants, Muslims, people of color, LGBTQ people, women, workers, the environment, and much more. They were there to take a principled stand. Charges against some of the arrested include serious felonies. For the safety of the arrested we are withholding their identity at this time. We are also refraining from going into detail about the circumstances of their arrests until we are able to consult with their legal counsel. However, it is reasonable to say that the arrests were the result of overly aggressive action by the police. At this time, we know that two of the people arrested are members of the Industrial Workers of the World and our General Defense Committee. The Union supports our fellow worker(s) as well as the other people who were arrested and we are calling on you to support them as well with donations to support their legal defense. Funds raised will be provided equally to support the legal expenses of all four of the arrestees, which may run several thousand dollars. 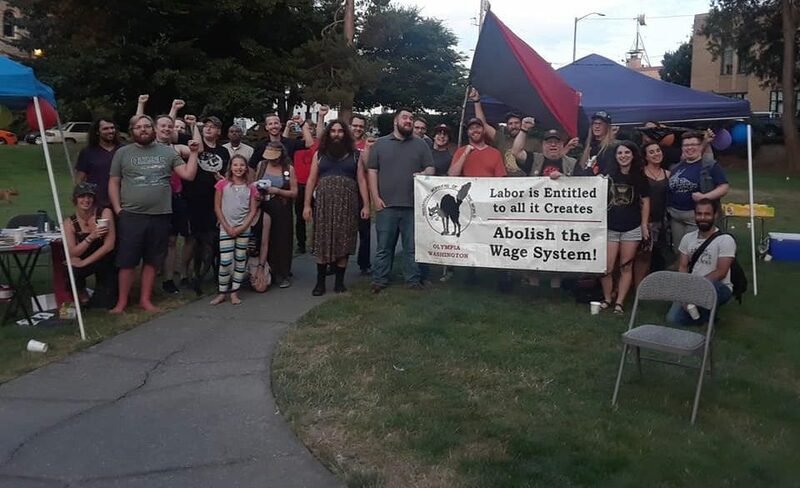 Any money in excess of what is needed to pay legal expenses of the March 4 arrestees will go to Local 20 General Defense Committee to support future legal expenses of Olympia area activists resulting from involvement in labor struggles, anti-oppression, and environmental defense work. You can donate to the legal fund of those who were arrested here.